Tata Motors today launched the Tata Aria, the first Indian four-wheel drive crossover, a luxurious creation with the finesse of a sedan and the muscle of an SUV all blended in one car. 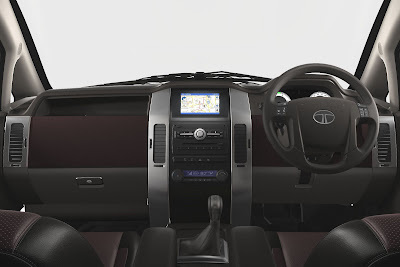 The Tata Aria redefines several benchmarks with its design and technologies, offering class leading features that take comfort and safety to a new height. The selectable 4x4 is equipped with a Torque-on-Demand System which significantly enhances all-terrain capabilities. It is the first in its segment with an In-dash GPS-based Navigation System. It is also among those rare cars in India to offer advanced safety features like the Electronic Stability Programme (ESP), which ensures the car’s stability, and six airbags to ensure safety in exigencies. The Aria’s styling is a blend of bold proportions, uncluttered lines and uncompromising aesthetics. The aggressive, well planted stance is tempered by a lunging silhouette and a dynamic roofline. Wraparound dual barreled headlamps complement the signature Tata grille. Chrome detailing on the sides accentuates its premium class. The interiors reflect the same richness and elegance in design, layout, and visual appeal. Premium leather upholstery enhances richly textured trims in single or dual tone themes. Air-conditioning louvres on pillars and a sweeping row of roof utility spaces add to the distinctive appeal. Passengers can simply walk into the Aria, rather than having to climb up or get down into the cabin. The three-row theatre style flexible seating ensures ample space. Like the driver’s and the front passenger seat, the second row seats can also be slid fore and aft to increase legroom. Both the second row and third row seats can be fully collapsed to make the car even roomier for accessories and luggage for that weekend sojourn. The height-adjustable driver’s seat and the tilt adjustable steering help configure the most comfortable driving position. The glasshouse offers commanding visibility, aided by electrically adjustable ORVMs. There is no need to look back even to park – a Reverse Guide Camera helps you with exactitude. As you drive out, the In-dash Navigation System guides you to your destination, the Driver Information System continuously indicates essential drive data, the Cruise Control allows you to set speed, and the Automatic Climate Control, through roof-mounted AC vents, keeps the cabin temperature ambient. The 2-DIN music system and Bluetooth, along with steering mounted phone and music controls, helps switch between music and conversation at the touch of a button. Other features do not even require raising a finger – Darkness Sensing Lights will come on automatically, as will Rain Sensing Wipers. Roof utility bins, a glove-box chiller and conveniently placed cup holders helps keep every thing you want within easy reach. 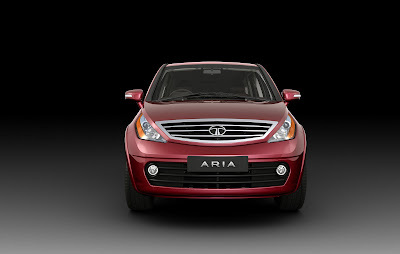 The Aria’s stylish design is inlaid with the DNA of an SUV, manifested in its stance, power, driveability and safety. Its 2.2 litre Direct Injection Common Rail (DICOR) engine, with variable turbine technology and 32-bit ECU delivers 140 PS power and 320 Nm torque. It is equipped with a dual mass flywheel which isolates torsional vibrations from the powertrain, thus providing a NVH free environment in the cabin. The new Mark II gearbox is perfectly mated to the engine ensuring smooth power delivery and precise shifting. The suspension is designed to achieve an optimal balance between ride comfort and control and stability, both on normal roads and in offroading. Its low-roll characteristics and higher soaking capacity further ensure a sedan-like ride quality and SUV-like offroading capability. The 4x4 Adapterra Torque-on-Demand System on its own senses terrain conditions and automatically supplies torque in varying proportions between the front and rear axles, depending on the terrain. It helps off-road driving as well as stability on normal roads. The Aria boasts of best in class safety features, making it one of the safest cars on Indian roads. The Electronic Stability Programme (ESP) senses any mismatch between the driver’s intended direction and the actual direction of the car, and automatically intervenes to apply braking force to the appropriate wheel and stabilises the car. Along with ESP, the Traction Control System (TCS) maintains stability under situations of sudden acceleration. The Aria is equipped with disc brakes on all four wheels resulting in superior braking effectiveness and better control. The Antilock Braking System (ABS) with Electronic Breakforce Distribution (EBD) aids steerability and control in emergency braking situations and on slippery surfaces. The Aria’s frame is constructed with advanced hydroformed members. Hydroforming enhances their rigidity while reducing weight. Besides, the body shell has crumple zones and the doors have side impact bars. Six airbags (driver, front passenger, side and curtain airbags) protect occupants from every side. Besides India, the Aria satisfies all current crash safety norms in European markets. The Tata Aria is being launched in three trim levels, all with 4x4 – the Aria Pride at the top end, the Aria Prestige and the Aria Pleasure, each in eight colour options. 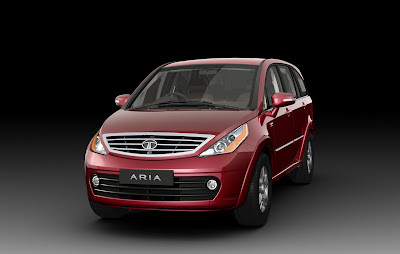 While the Aria Pride is fully loaded, features will vary in the Aria Prestige and the Aria Pleasure (details in www.tataaria.com). The Tata Aria is being made available, to begin with, in 25 cities through 69 dealerships.